Occupied Balochistan: Endless Human Rights Violations by Pakistani security forces continue in Balochistan unabated. 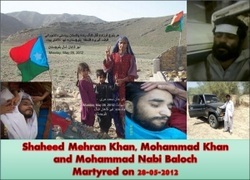 Eight bodies of abducted Baloch were found in different town of Balochistan on Sunday (28-05-2012). Pakistan military have celebrated ‘’Youm-e-Takbeer’’ (Nuclear blasts remembrance day) by gifting Baloch nation with eight more bullet riddled bodies, abducting 5 youths and setting on fire an entire village in Balochistan’s Pat Feeder region. Media sources reported that four bodies, including three of abducted Baloch persons, were found in Ferozabad and Pashtoonabad neighbourhoods of Quetta on Monday. Superintendent of Police (SP) Saryab Sikandar Tareen confirmed that a police patrol found three bodies stuffed in gunny bags dumped at an abandoned place. The bodies were shifted to the Bolan Medical Complex Teaching Hospital for medical examination where the bodies were identified as that of two brothers, Muhammad Khan Marri and Muhammad Nabi Marri. The deceased were living in Sariab area but were permanent residents of New Kahan Quetta, Balochistan. Their cousin, Rehman, identified the bodies. The third body was identified as that of Mehran Khan Kiyazai, a resident of Brewery Road. Mehran’s body was identified by his father. The two brothers Mohammad Khan Marri and Mohammad Nabi Marri and Mehran Khan were abducted by personnel of Pakistani intelligence on 11/04/2012 from Quetta. Mohammad Khan Marri was a writer and journalist who contributed to different local news papers in Balochistan, including DailyTawar and Asaap Publications. Medics said that the bodies bore rope marks around their necks, which indicated that they were strangled to death. According to the Voice for Baloch Missing Persons (VFBMP), an organisation striving for the safe recovery of abducted Baloch Persons, the victims, all aged between 25 and 30, had been abducted by Pakistani security forces last month near Zarghoon Road in Quetta. “They were listed as abducted, their relatives recorded statements before the Supreme Court and their video footage was shown by police during the Supreme Court hearing in Islamabad,” VBMP chairman Nasrullah Baloch said. Separately, another body was found in Pashtoonabad area of Quetta. According to official sources some passers-by spotted the body and informed them. Police rushed to the spot and shifted the body to the Civil Hospital. The body was identified as that of Habibullah. Karachi: Bullet riddled body of Baloch man found in Karachi was identified as Nasir Hayat s/o Mohammad Hayat, a resident of Surab town of Balochistan. He was abducted few days ago from Hassan Square near old Sabzi Mandi area of Karachi. Hayat was founder of Surab Public Library and ex-president of Shashan welfare development society. Khuzdar: Bullet riddled body of Baloch youth was found from Khanak area of Khuzdar in Balochistan. Body shifted to hospital for identification. However, his identity could not be ascertained until filing of this report. Dera Bugti: Two mutilated dead bodies of missing persons found in Panyhan area of Dera Bugti. The deceased have been named as Ali Khan s/o Shah Nawaz and Wali Mohammad s/o Ghulam Mohammad. They were abducted by Pakistani occupying forces on March 12, 2005 from Dera Bugti. Both victims belonged to Karmazai clan of Bugti Baloch tribe and were residents of Dera Bugti town, the Baloch Republican Party sources said. Furthermore, the brutal offensives of occupying forces continue unabated, the forces violated the sanctity of many houses and set ablaze standing crops of Baloch farmers in Pat feeder area of Dera Bugti. Pakistani brutal forces indiscriminate firing and shelling also killed number of livestock. Five Baloch including three sons of Mehr Gul Bugti namely Shahal, Meeral, Sharbat, Billo s/o Ghulam Haider and Punnoh Bugti were abducted during latest military offensives. Meanwhile, the Baloch Republican Party (BRP) has released the video footage of burning houses in Pat Feedar region of Dera Bugti saying that these houses were set on fire by Pakistani security forces during military offensives on 28-05-2012.